We are finally beginning the rebuild. AJ wants to be in Antigua in April for the Round Antigua race. It's scheduled the Saturday between the Antigua Classic week and Sailing week. There should be at least two J Class sloops attending. AJ has been wanting to see J Class sloops under sail since his father first showed him pictures as a boy, but since they were the America's cup boats of the 1930's, they had all been scrapped before AJ, or his dad, could ever see them. However, in the beginning of this century there has been a revival of the class with a few boats restored and relaunched, and more being built to original plans. Glorious 120+ ft full keel hulls with long slender overhangs and 160+ foot masts. Seeing one of these monsters launch their 18,000 square foot spinnaker is a feat that is sure to impress. AJ invited his dad along to crew our boat for the race. They'll get to watch them for the first time together. Talking about going to Antigua was a paradigm shift. It's easy to get lost in the work, and even forget what I've been working for when there's no foreseeable end to it. After 17 months of living on a boat without systems or an engine, and the last few months living off the boat moving our grubby selves and grubby boxes from place to place, it's hard to even imagine having a real home again. Much less one that takes me to Antigua. We only got to sail once before the engine failed. We've been helplessly tethered to a ball or dock since. The story this blog was intended to tell hasn't started. But for the first time since we bought the boat, we can talk about cruising and make tentative plans. And I can start imagining life on the sea as I did when the proposal to do so was first made. We will be living aboard by December, and sailing south soon after. We'll be underway in March when we'll celebrate two years of boat ownership and the 6th anniversary of the plan to sail away. There is still so much work to do! And it feels good to be doing it. Phase 3 is commencing! Our rudder is back, new, improved, rebuilt, and three times heavier. We managed to sneak in two barrier coats and two bottom paint coats between afternoon rains this week. We had a little hull work to do before splashing. To finish the newly oversized cockpit drain system, we replaced the two ancient 1 1/2" thru hulls with 2" marelon thru hulls. AJ resized the existing holes and chiseled off the wood backing pad. The hull is about 3/4" thick here, and the pad was nearly another 3/4", to the point that the new thru hulls don't even have exposed threads inside. The backing pads were needless overkill, especially for an unvalved passive drain. We installed the new thru hulls with 5200. 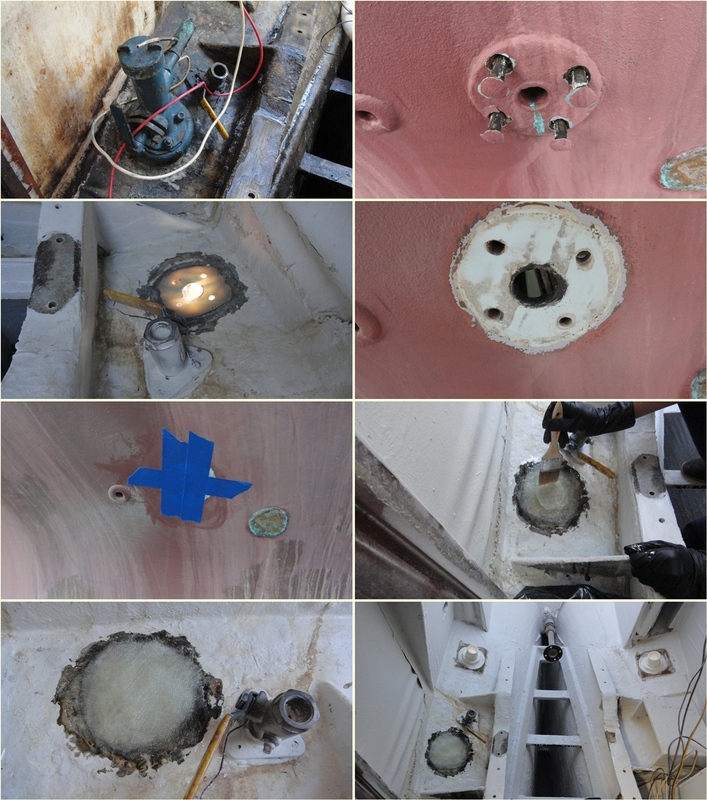 Then AJ decided he wanted to remove and patch the thru hull shown in the upper left corner of the pictures below. It's old, scary, and won't be plumbed to anything. 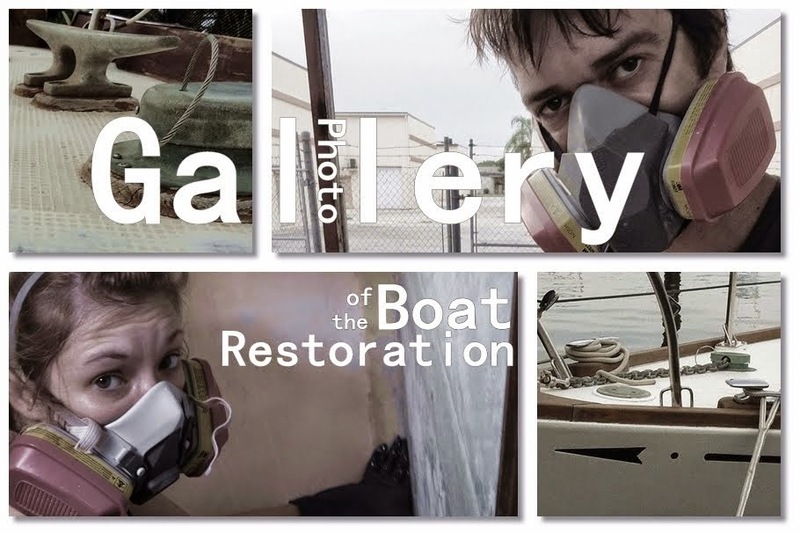 Why didn't we do this prior to having the boat bottom and engine room painted you might ask? I asked. The answer was a shrug. I'm so happy we're finally moving forward again that I can't be bothered to be pissed about having a new coat of fiberglass dust all over the newly fiberglass free engine room. AJ removed the giant thru hull strainer contraption, and pounded out the bolts. Then he ground the thru hull area into a dish on the inside while I sanded and prepped the outside. 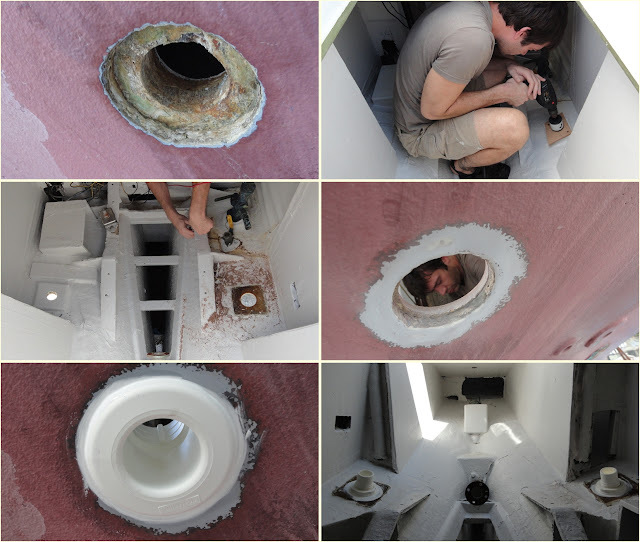 We taped over the holes from the outside to provide a smooth fair surface for the epoxy and fiberglass on the inside. I cut eight circles of decreasing diameters from a thick fiberglass bi-axial cloth w/chop strand mat backing. I laid strand thickened epoxy in the holes against the tape. Then glassed in the circles. The largest circle was laid first, then the subsequently smaller ones. The last patch was a second large circle to cover the stack. Hot damn I patched a hole in a hull. Just gotta pull off the tape, sand and paint. The back of the boat is also prepped for the rudder's return. The dished back portion did not get sanded and repainted with the rest of the bottom because the rudder was in the way, so we tended to that. The gudgeon has been cleaned and cracks welded. It's now barrier coated and ready to re-join the rudder. While we had some thickened epoxy whipped up for the hull patch AJ ran down and filled the little holes around the cutlass bearing and built up the low portions. 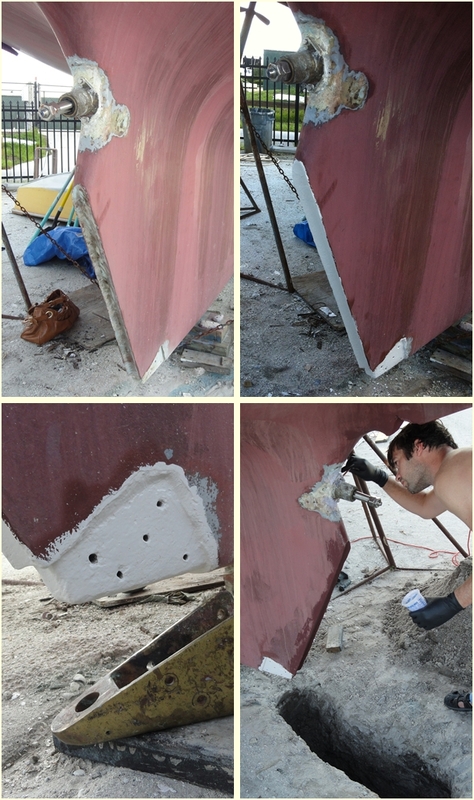 While AJ was grinding I took it upon myself to re-dig the hole under the rudder. We filled it back in when it started caving out underneath the boat in the rain. And now we are ready to install the rudder. Today! We have been following your blog with quite a bit of interest. 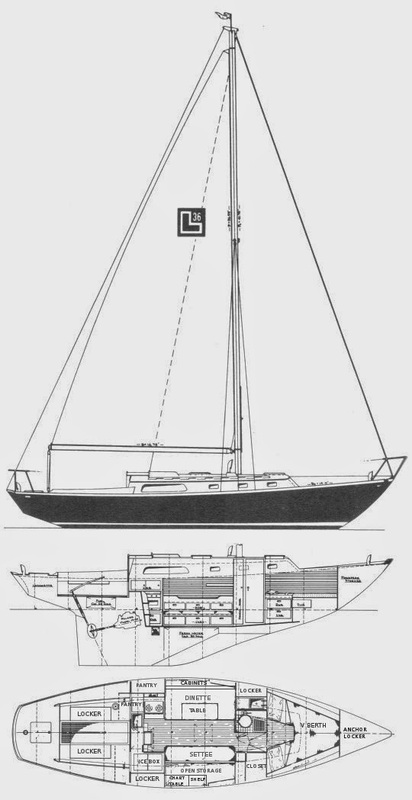 We just purchased a 1968 CL Luders 36 (Yawl), and ultimately have the same plans as you, although on a slightly longer timeline. Our boat has many of the same problems you have been addressing, although the rudder has already been fixed, and it already has a new Yanmar. Choosing to post a message on this entry because of the through hull work you are doing. Our Galley sink and the head for that matter exit through the hull just below the port waterline. 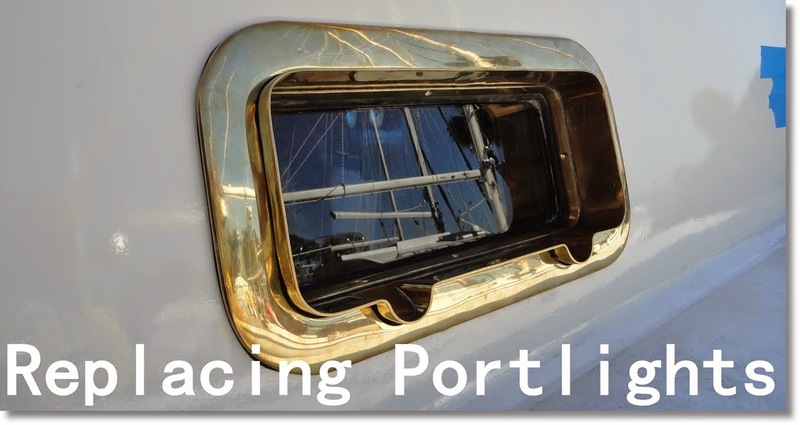 It does not look like they will drain well while on port tack - have you considered this? Also both sinks have check valves (which we can understand), but also p-traps which don't seem to make any sense at all. Are yours the same? Cheers and good luck - we will keep following. 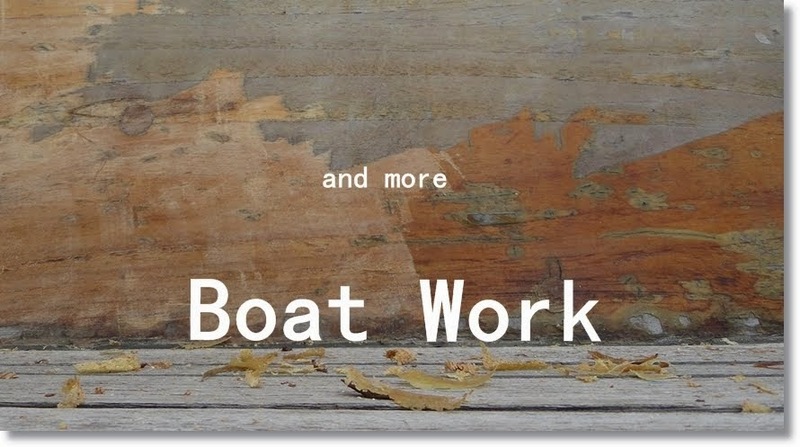 You picked a 44 year old Chinese built project boat? Are you crazy?! ;) Nice pick on the yawl by the way. I would have preferred a yawl myself, but this sloop was the right boat at the right price at the right time. It'll be nice to have the mizzen for steering/stabilizing/anchor-riding assistance. The mizzen provides a more precise ability to balance the helm. Both our galley sink and our head exit near the waterline. The head sink drained to the bilge(?!?!) but we are changing that. We do have a p-trap on the kitchen sink, but it is an old piece of solid bronze pipe. We will be eliminating that and going with a modern flexible hose that routes straight to the thru hull, no need for a trap. As for back flow valves, we have none, but we do have lever controlled ball valves at both locations. I can't see a problem with the head as its discharge is pressurized when in use, and there is a check valve when not in use, but the galley sink may be a problem. I'll likely add a backflow valve to that, but PO never mentioned it being a problem, and he and his family lived aboard and cruised extensively. 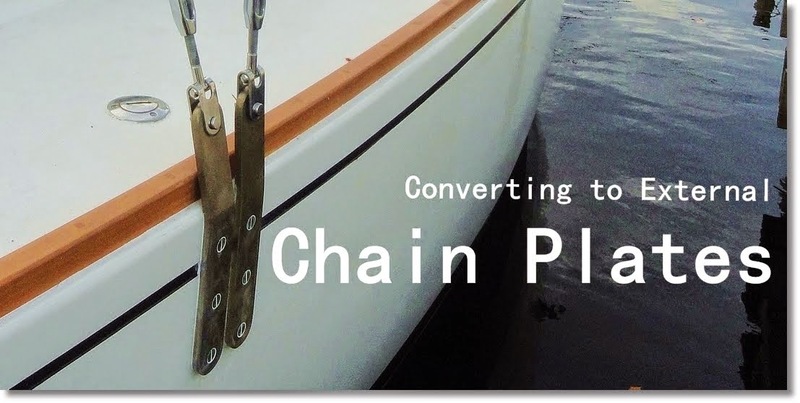 Bottom line though: we do not enough experience sailing our boat in sea conditions to know if the sink is going to backflow, but if it does, then we can just close the hole and drain it when we get the chance, either at the next stop, or the next starboard tack. There are a lot of design flaws in this boat: splitting a cabin window with a bulkhead (!?!?! ); only supporting the mast from the center to port with nothing from center to starboard; the large crescent shaped areas on either side of the keel tank that don't drain to the bilge, lack of a good location low enough for a wet muffler... speaking of which, I would be very interested to see how your Yanmar is plumbed. 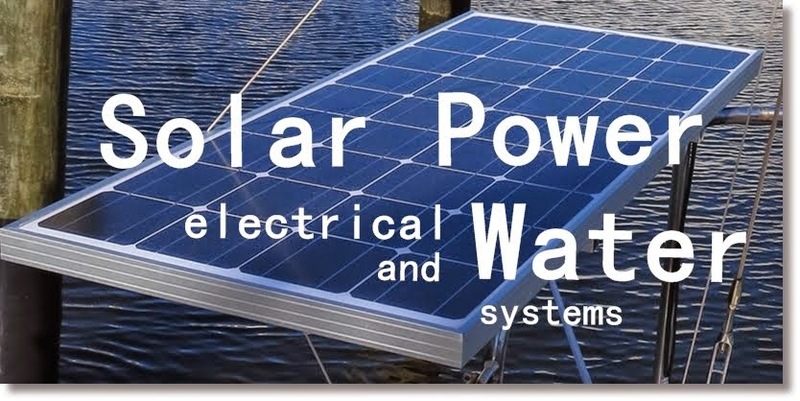 Also, what model Yanmar is in your boat? Thank you for the response. Yes we did choose a 44 year old boat, same reasons as you: right size, right price, right time. She did go through a pretty major refit, albeit 20+ years ago, solving many of the deck and topside issues, but still plenty of work to be done. We are on the hard already here in the Northeast, so our time involved in sailing was a delivery from Maine to Massachusetts, and a couple of day sails. So how the sink drains work underway is impossible to determine since they were both clogged and not draining even at rest. Our head sink and galley sink are both plumbed the same way. 1" bronze or copper p-traps leading to check valves leading to (thankfully) working seacocks, both just below the waterline. The galley sink has since been cleared, a rusting phillips drill bit caught in the trap. The head sink waited till we were on shore, and I have torn it apart to reveal hair and other nasty crap in the check valve. I don't think check valves will work at all, when you need them is on starboard tack, and gravity check valves will be open on that tack. My concern is that it appears that at least the galley will have to run "uphill" to drain on port tack. We will see. Our head (toilet) drain is well below the water line, both pressurized and with a vented loop. I will try to get down to the boat and snap a couple of pics of the engine plumbing for you. Our engine compartment looks like yours did - we have the inches of slime and grossness to dig out - so I am not sure how the pictures will look. The surveyor (for whatever that is worth) thought the engine installation was "very good" (and he did not say that for much of the rest of the boat). It is a 2004 Yanmar 3gm30. We have a "manhole" cover for access through the cockpit (about a 18" round aluminum inspection port) - very interested to implement your cockpit cover. Also waiting to hear your reports on using a tiller versus the wheel under sail. Would love to get rid of that pedestal - plus would rather have a tiller anyway. Did you have your tiller custom made? Or semi-custom? What is the length? Do you know of a way we can establish a Private Messaging link without incurring the wrath of spam? Mayeb you can PM me through facebook - I just "liked" your page yesterday - or you could perhaps know that our boat name is yacht.veria and we use google's mail server.